Would you have any ambition to spend over $1,300 on a pair of sneakers? Freaker Sneaks are hoping you’ll do so for a brand new pair of Game Boy themed sneakers. The group is only making ten pairs of these special sneakers that are designed to look like the original Game Boy, in the shape of some old-school Jordans, for the price of $1,350. Would you be willing to pay that much for sneakers? Tell us in the comments while we give you the description of the sneakers from the company. In the year 1989, arguably two of the most iconic products were introduced to popular culture. 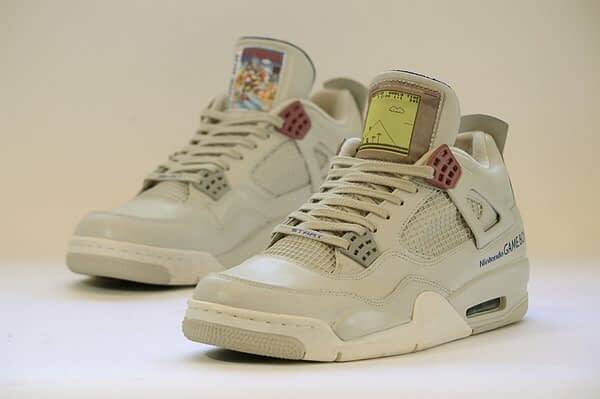 The Air Jordan IV and the Nintendo GAME BOY. This handheld console sold almost 120 million units and provided hours upon hours of joy for kids and grown-ups worldwide. Many classic games were available but personally, Super Mario Land holds a special place in my heart as I’m sure it does with millions of others. This pair features an actual game cartridge as the hang tag and the buttons and D-pad are of course pressable. Only 10 pairs will be made available.